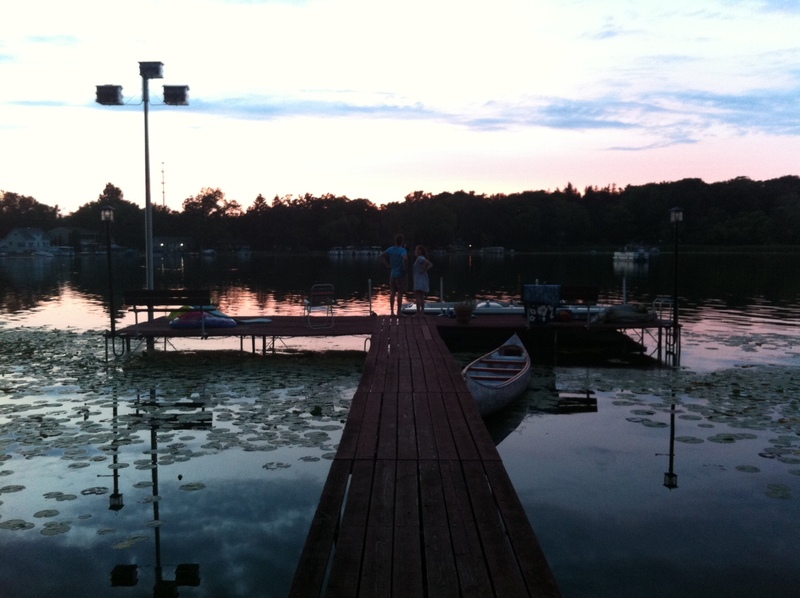 Photo: The dock, earlier that evening. Stephen steered the rumbling boat out of the inlet, toward the middle of the lake. It was nearly midnight, and it had taken effort for the eight of us to get ourselves back down to the dock and into the boat after a day of tubing, wakeboarding, swimming, and cooking (not that anyone deserves sympathy for that brand of weary). But still, tired feels like tired no matter how you come by it, whether by hard work or hard play. We all make choices about whether we can do that “one thing more,” based on often-flawed predictions of regret. Will I regret being out there in the cold night, when I could have been snuggled in a warm bed? Or would I regret not going—turning down an experience I don’t even have the privilege of contemplating 364 days a year? Not only were we staying in a cottage on a lake in Wisconsin, away from the light pollution of cities, but the sky was clear, there was a boat to use, and a significant meteor shower was scheduled to peak that very night. Sleep could wait for when we were back home, surrounded by corn fields. So we bundled up against the autumn-like chill of the August night to venture out onto the lake. After a day of sun and thrill-seeking—of pushing the boat to go faster and the kids on the tubes to scream louder—the darkness and silence that surrounded us when Stephen cut the motor and Jason dropped the anchor was thundering in its own right. I leaned my head back, letting it rest on the edge of the boat, giving my neck muscles permission to let go and willing my mind to do likewise. Letting go was harder, of course, with my mind. I tried to take in too much at once, my eyes darting here and there, wondering what exactly I was hoping to see. Then, as others in the boat quietly called out “There was one,” “I just saw one,” I began feeling frantic that I wouldn’t see anything at all. Finally, I let go of my intense sense of focus on certain spots in the sky—always one step behind, right where something had just been. Broadening my view and softening my mind, I allowed my more inclusive, peripheral vision to take over. And then I saw one—a star shooting through the dark. And then I saw another. And another. And then I thought, “I’m glad there are still things in this life that can’t be captured on Instagram or Twitter.” I just sat there, in the dark silence, giving my mind and eyes over to the expansive sky. It’s been more than a month since I blogged at all, and more than four months since I blogged with any regularity. The stress of buying and selling houses, and then moving, overlapped with the stress of more converging work deadlines than I’ve had in years. But my problem hasn’t really been a lack of time as much as it has been a lack of space for thought. For months, the motor in my mind has been roaring, never stilling itself long enough for the anchor to be dropped. My vision has been laser focused and always darting, from one point of concern or interest to another, often feeling one moment behind where I need to be. I simply haven’t found myself beneath any large expanse of quiet peace that invites me to soften myself into it. And yet, my life has been lived these past few months. Important things have happened and I have grown, even though each step wasn’t documented on Twitter and my blog. My only regret is that I allowed myself to feel so burdened by the unplanned hiatus and its imagined effects on my writing career. It was only for a time. An expanse of space is out there, just ahead, and I can already feel my mind broadening to meet it. Thank you Katie! I was sort of laughing at myself (and making my brain hurt) as I thought about how I was indeed trying to capture something that supposedly couldn’t be captured. I almost ditched the whole post, wondering if it made any sense! But there is a different, I think, between just documenting everything that happens, and processing and sharing it. The documenting tends to happen when we are in a hurry, and while it can serve a purpose, it doesn’t have depth and value. I’m hoping I’m back to a space where I can process and share. I’m glad you’re here with me. The only loss during your hiatus was ours. You, however, have gained life, and love, and the big picture. We will all be richer for it. It always feels good to emerge on the other side of something difficult and big. I’m still not sure exactly how the experience has changed me or what I’ve learned, but I’m looking forward to finding out as I write! Thanks, as always, for your steady encouragement and friendship, Ray. Always good to read your words, friend. Thank you, Leigh. It’s always good to see you here! Perfect descriptions in that 2nd last paragraph. And, yes, the laser focus is at times right and necessary, but that darting action, never landing long; that’s just how it feels. Glad to read you again. Isn’t it funny that often the harder we try to do something, like see, the worse we are at it? Deep breaths are always a good choice for me, whether laser focus or a broader view is called for.